Edward Irving "Ed" Koch (December 12, 1924 – February 1, 2013) was an American lawyer, politician, movie critic, and television personality. He was the 105th mayor of New York City from January 1, 1978 through December 31, 1989. He was also part of the House of Representatives. He was a judge for the television judge show The People's Court. Koch was born on December 12, 1924 in The Bronx, New York to Yetta (née Silpe) and Louis Koch. They were a Polish-Jewish family from New Jersey. He was raised in both The Bronx and in Newark, New Jersey. Koch studied at the City College of New York and at New York University School of Law. Throughout his career, Koch signed many bills including one that allowed gays and lesbians to marry in New York City. Another well-known act he did in New York was that he helped try to find a cure for AIDS. He had many preventions and awareness programs. He was a Democrat. He ran for Governor of New York, but lost the election. His career began to slowly come to an end after Koch suffered a stroke in 1987. When he was a representative, he supported the Civil Right Act during the 1960s. Koch never married and had no children. Many thought Koch was gay because of the pro-LGBT policies he supported and because he never married. This made Koch angry and told everyone he was not. Koch went to the hospital on January 19, 2013 and left on January 26. He went back to the hospital on January 31, 2013 because he had chest pains and liquid in his lungs. The next day on the morning of February 1, 2013, Koch died in Manhattan, New York from heart failure, aged 88. He was buried at Trinity Cemetery and Mausoleum in Manhattan, New York on February 4, 2013. Many people went to his funeral including former United States President Bill Clinton. His marker are written in the last words of Daniel Pearl. He has a Star of David somewhere in his grave. The epitaph of his grave says: "He was fiercely proud of his Jewish faith. He fiercely defended the City of New York, and he fiercely loved its people. Above all, he loved his country, the United States of America, in whose armed forces he served in World War II". (On the occasion of his primary loss to David Dinkins) "The people have spoken...and they must be punished." "I'm the sort of person who will never get ulcers. Why? Because I say exactly what I think. I'm the sort of person who might give other people ulcers." "If you agree with me on nine out of 12 issues, vote for me. If you agree with me on 12 out of 12 issues, see a psychiatrist." ↑ "Koch, Edward Irving – Biographical Information". Retrieved 2009-11-11. ↑ "Ed Koch's Legacy". Gotham Gazette. 2005-11-14. Retrieved 2007-07-15. ↑ Koch, Edward. "Ed Koch: Hizzoner",New York, April 6, 1998 (published online March 30, 1998). Retrieved May 9, 2009. ↑ "Doctors to former NYC Mayor Ed Koch: You can leave hospital but lay off the salt". NBC News. Retrieved 27 January 2013. 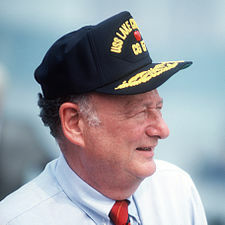 ↑ "Former Mayor Ed Koch Is Hospitalized". NY1. Retrieved 20 January 2013. ↑ 10.0 10.1 10.2 10.3 Joe Coscarelli (February 1, 2013). "The Quotable Ed Koch: Wit, Wisdom, and One-Liners". New York. Wikimedia Commons has media related to Ed Koch. This page was last changed on 20 June 2018, at 03:23.